Have you been living with one or more missing teeth, and you’re looking for a cost-effective alternative to dentures? At Apple Dental we can provide you with dental bridges as part of our full range of cosmetic dentistry and restorative dental options, all designed to help you achieve the very best oral health. We can use a dental bridge to replace one or more of your missing teeth, literally by ‘bridging’ the space between your remaining teeth. Secured in place by crowns attached to your teeth on either side of the gap, dental bridges are carefully crafted to seamlessly match your natural teeth. Bridges are a permanent restorative option that can also help to stop your natural teeth from moving out of their proper position over time, restoring your smile to its full natural appearance. Your dental bridge will be carefully constructed by our specialist dental technician following a detailed preparation procedure at Apple Dental in Lane Cove. It will be made from high grade porcelain which is fused to metal or tooth colour zirconia for extra durability and strength. Your bridge will meet the precise shape and colour specifications as discussed and documented during the preparation phase of your treatment. Dental bridges are a long-lasting, naturally beautiful solution that could solve the many concerns and issues you may have thanks to missing teeth. To find out more about dental bridges and how they could help your situation, please contact Apple Dental on (02) 9420 5050 today! 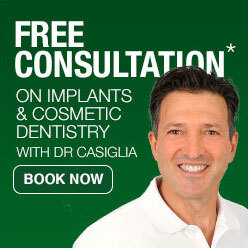 Also, you can find Apple Dental located at 1 Finlayson St Lane Cove NSW 2066. As their name suggests, dental bridges are teeth restorations that literally bridge the gap left by one or more missing teeth. 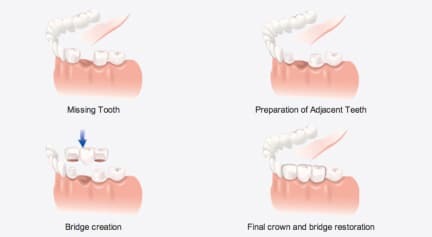 Bridges are custom-made and permanently fixed in place by being securely attached via crowns to your neighbouring teeth either side of the gap. Your dental bridge procedure cost will depend on your individual situation. To find out whether a bridge can help you, and to get an accurate estimate of your treatment cost, book your consultation with Apple Dental today. How long will my new dental bridge last? With a good at-home oral hygiene program, together with regular examinations with Apple Dental, you should be able to enjoy the benefits of your new dental bridge for 10 to 15 years, or even more. Is eating more difficult with a dental bridge? No. In fact, because we are replacing one or more missing teeth, you should find that eating is actually easier with the help of a dental bridge. But until you have become fully used to your new dental bridge, we recommend eating soft foods which have been cut into small, bite-sized pieces to aid chewing. Will I speak differently with a dental bridge? Because it can be difficult to speak clearly when you’re missing teeth, with a dental bridge you will speak differently. But the change will be all positive, because with all your teeth restored to their proper position, you’ll find it easier to enunciate more clearly. How do I look after my new dental bridge? Because the success of your new dental bridge will depend on having a solid foundation on your surrounding teeth, it’s very important that you ensure they are strong and healthy, thanks to a high quality at-home oral hygiene routine. Ensure you brush your teeth thoroughly twice a day and floss every day, to prevent the onset of tooth decay or gum disease, which can lead to tooth loss. Of course, the Apple Dental team will be more than happy to provide you with advice or a demonstration on how to properly brush and floss your teeth, including your new dental bridge. Attending regular preventive dental appointments in our Lane Cove dental practice will also allow us to attend to any problems early, avoiding the need for expensive treatment for more advanced problems. Restoring missing teeth or gaps with a bridge to provide an aesthetic smile and functional bite.